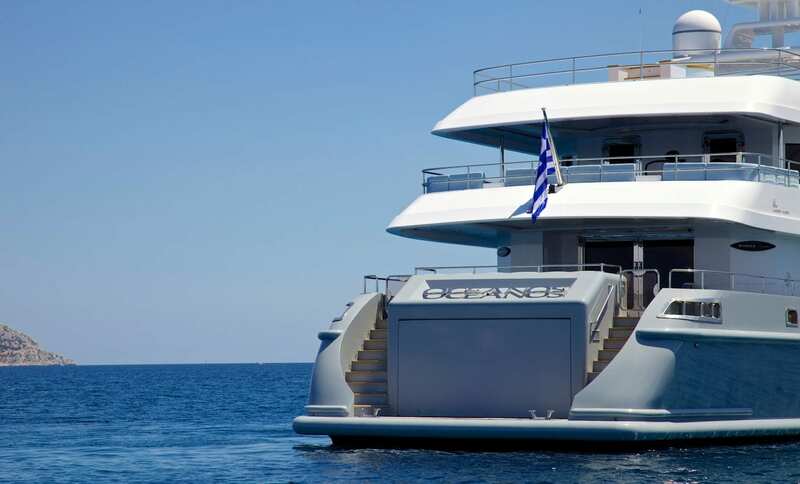 O’CEANOS is 161 feet of excellence in engineering and design. 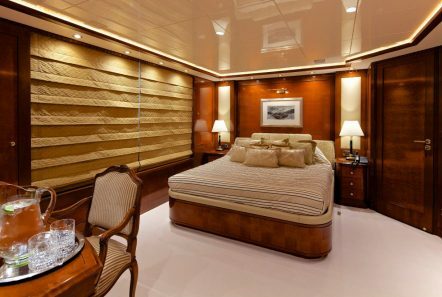 Fitted with Italy’s finest of woods, marble and fabrics she creates an environment of spectacular beauty and sophistication. 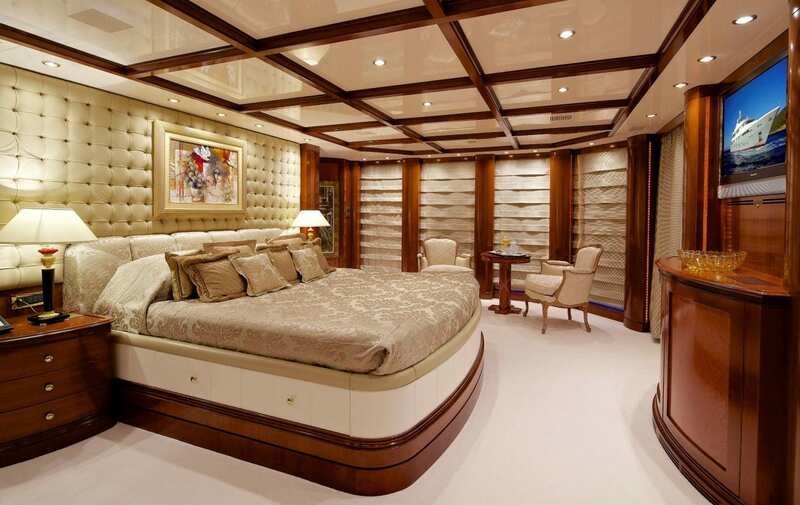 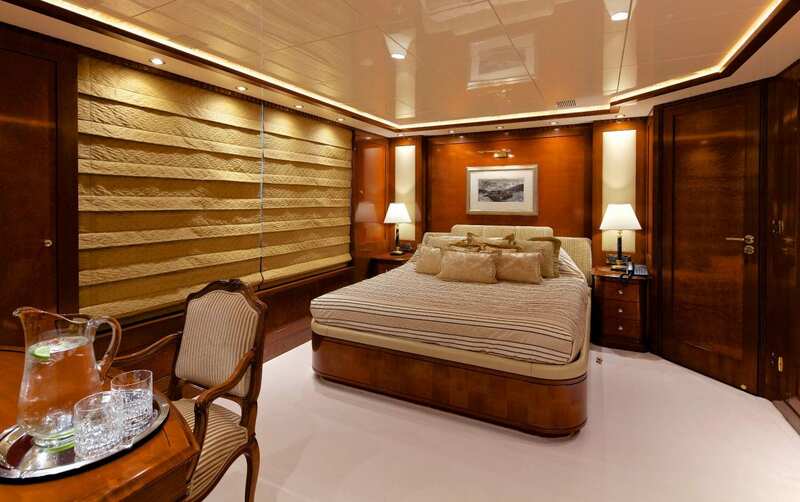 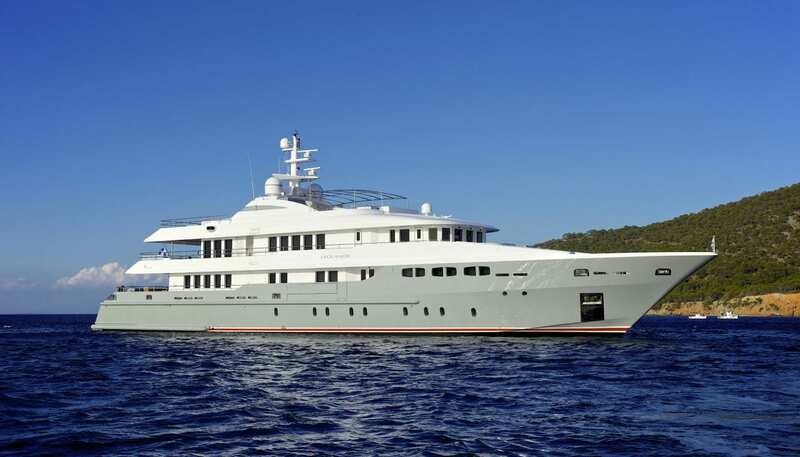 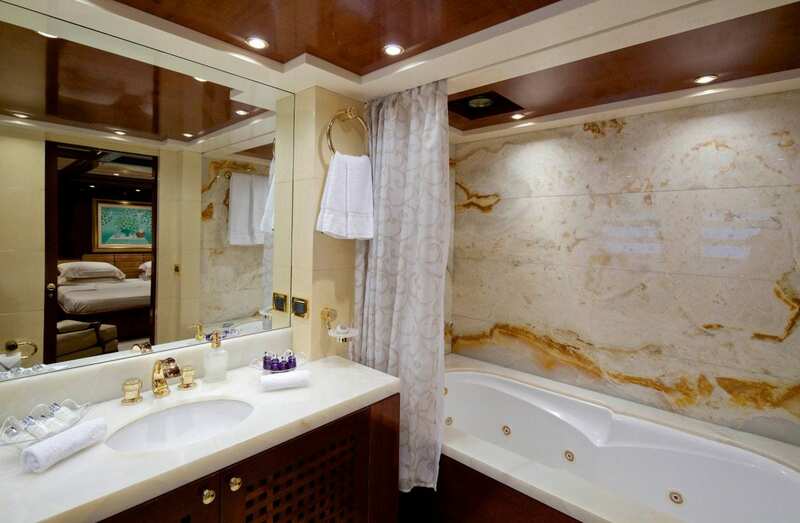 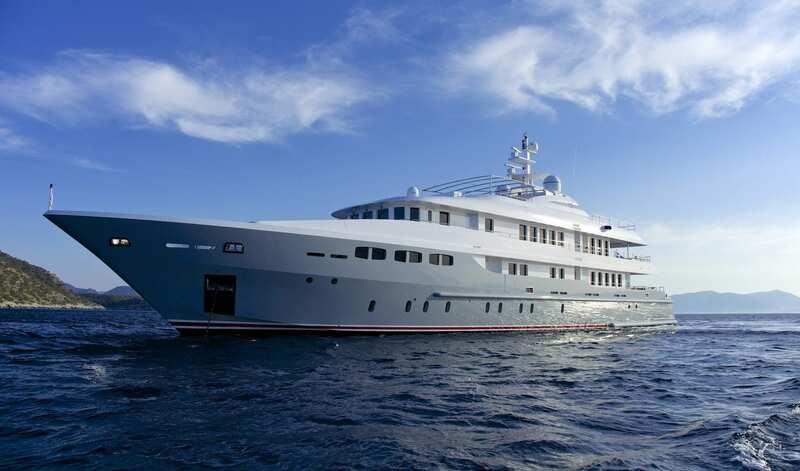 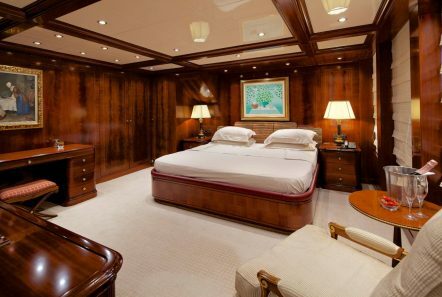 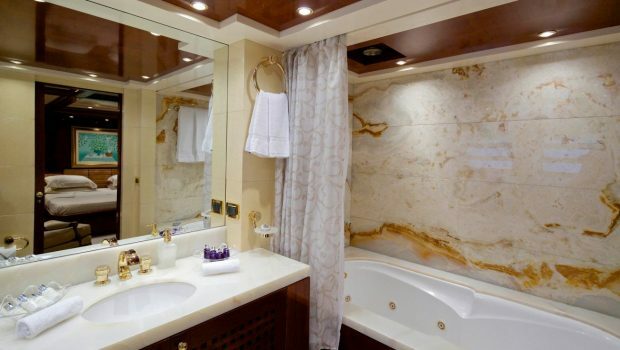 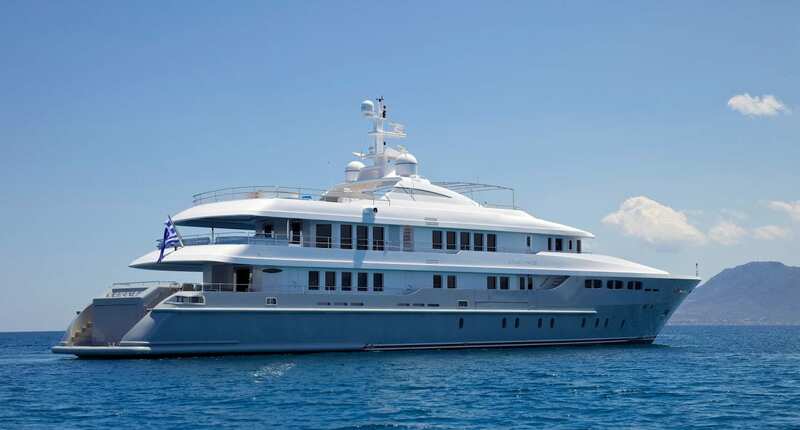 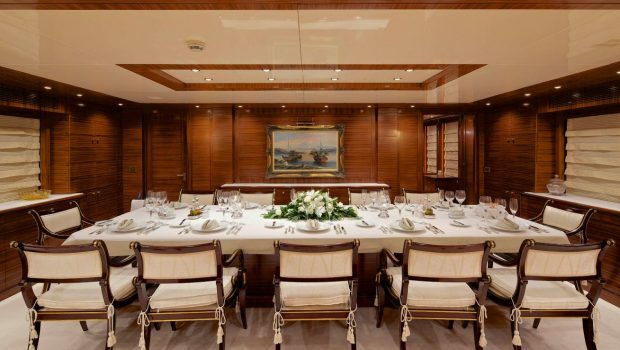 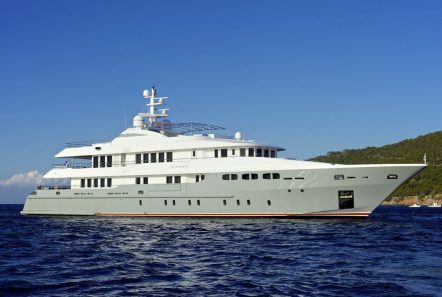 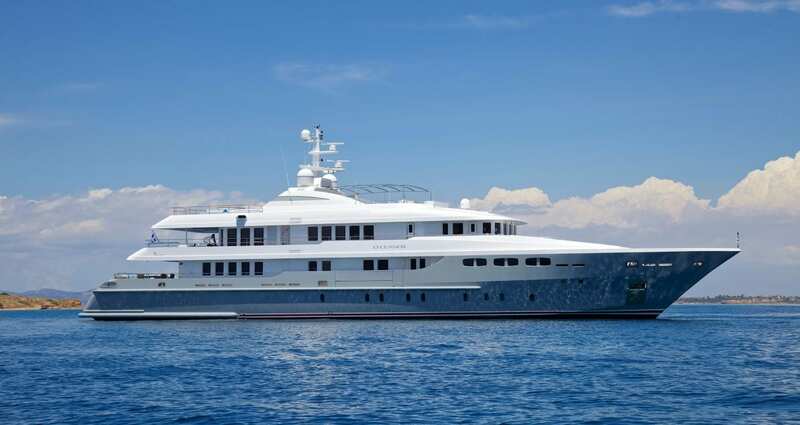 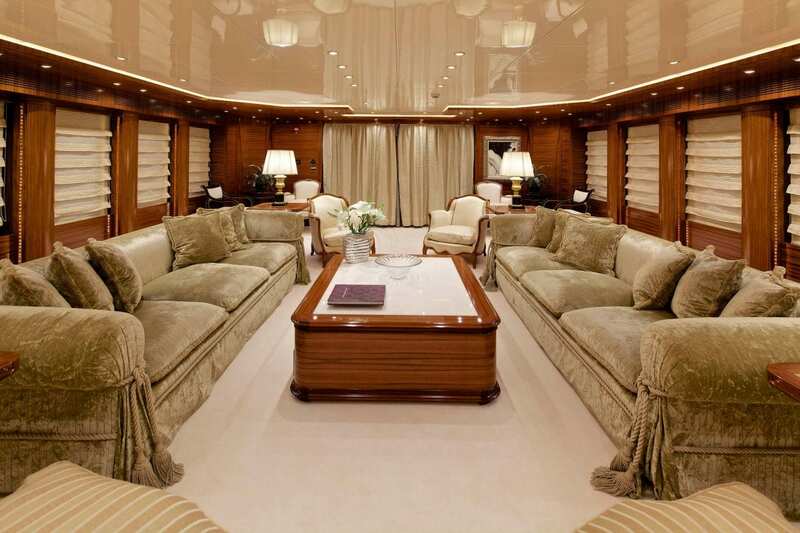 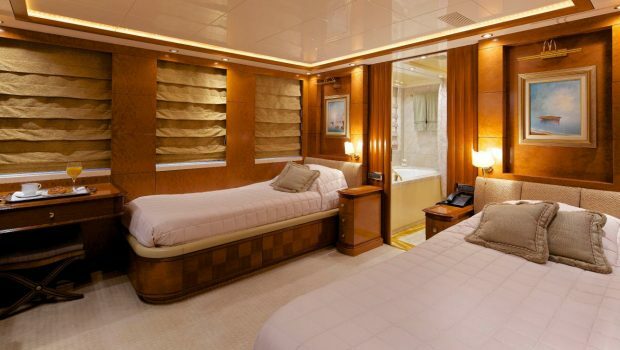 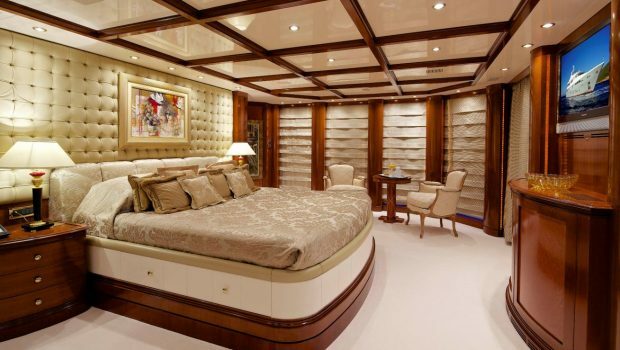 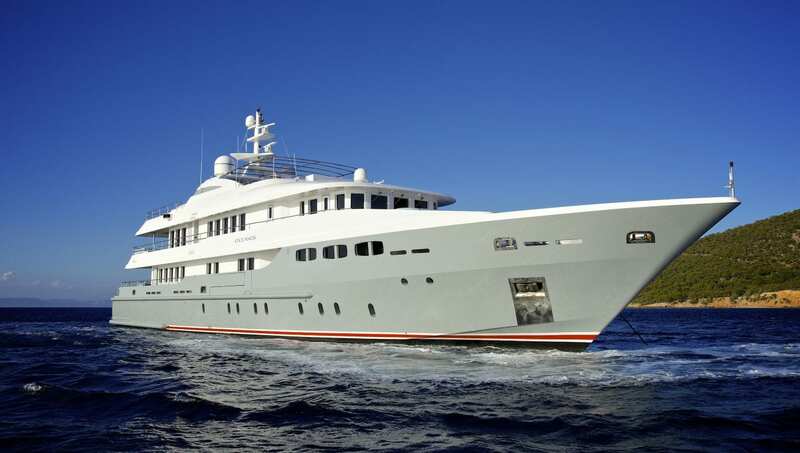 She accommodates twelve to fourteen passengers in seven luxurious staterooms in sumptuous elegance and perfection. 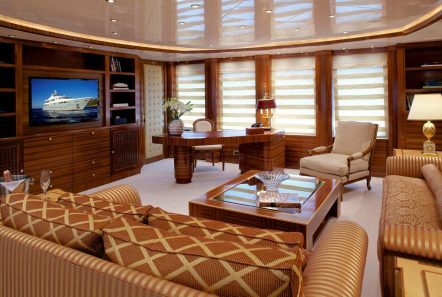 Owner’s suite: spanning two thirds of the upper deck is the owner’s cabin and adjoining private office. 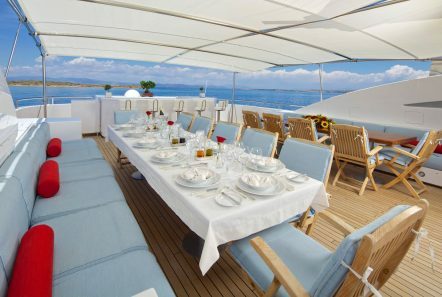 With a remarkable panoramic view of the sea and private balcony, guests will find it hard to leave this surreal sanctuary. 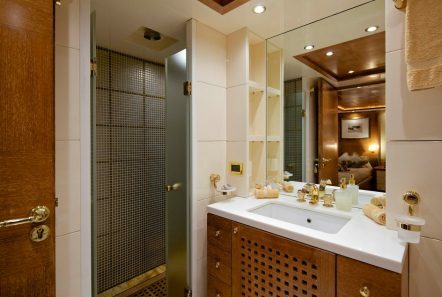 Designed in modern style, it features king sized bed, walk in closet, en suite bathroom and is equipped with a full entertainment system. Directly off the owner’s cabin, separated by an adjoining door and hall-way, this transferable space serves as either the private office of the owner’s cabin or as an upper salon set to entertain quiet moments of reading or interactive sessions of game playing and movie watching. 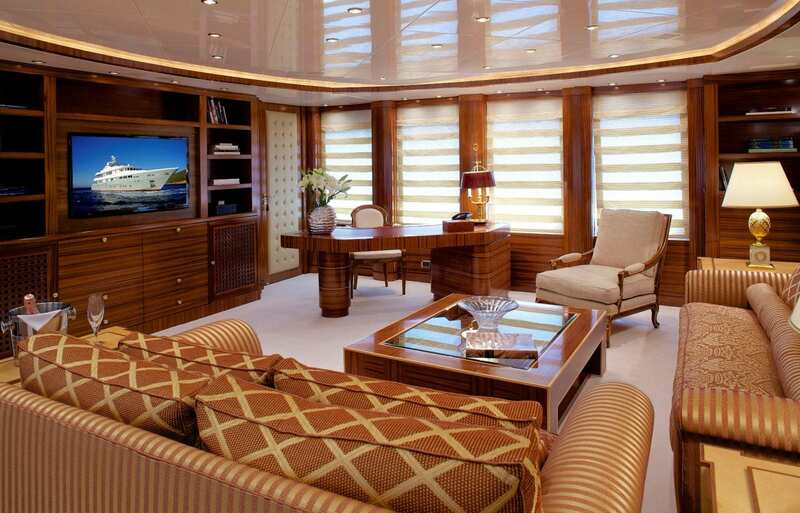 VIP Suite: The VIP cabin, set in deep rich mahogany paneling, and the adjacent twin cabin, with a lighter finish of burlwood paneling, have the unique ability to be transformed into a luxurious suite. 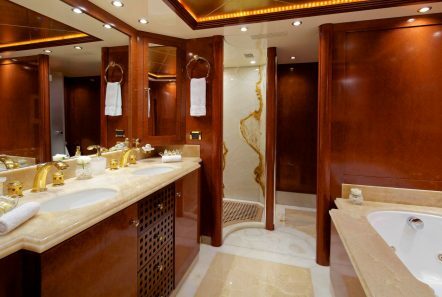 By simply closing off the area, a private lobby between the two cabins is created and thus a separate wing of complete privacy prevails. 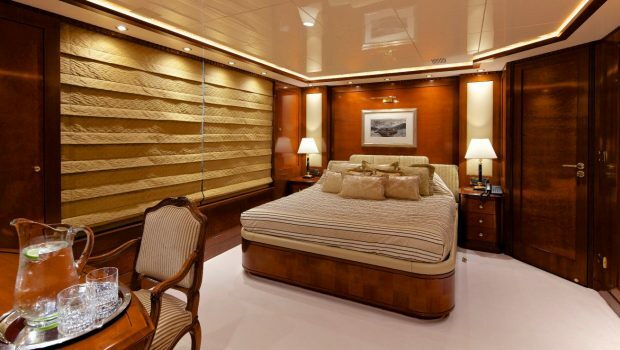 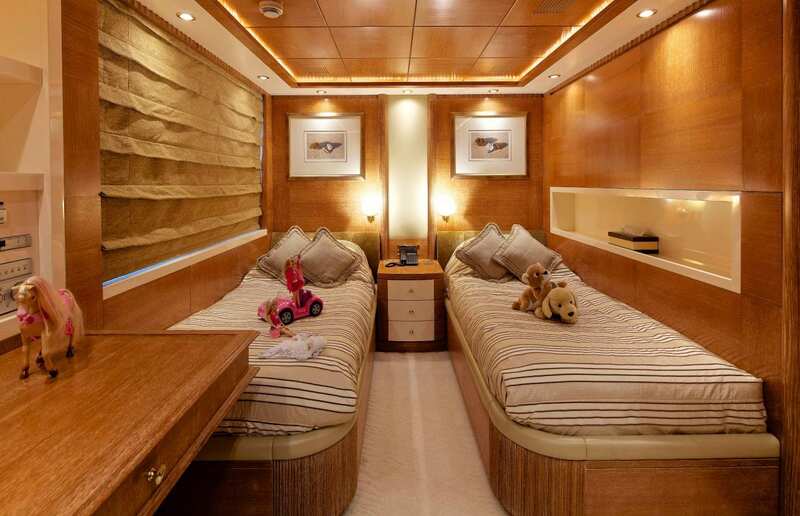 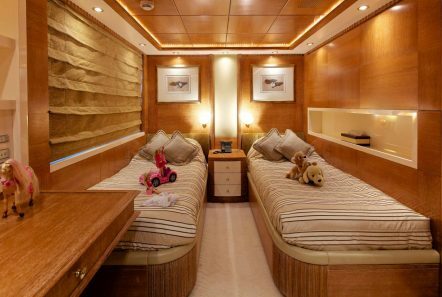 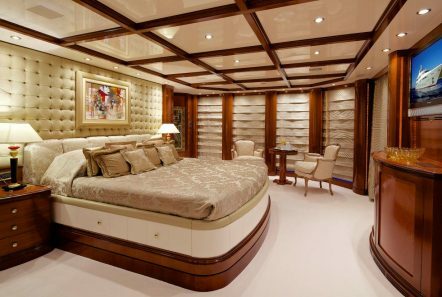 The VIP cabin features a queen sized bed, a desk that can be used as a boudoir or office space, en suite bathroom and large windows along its starboard side. 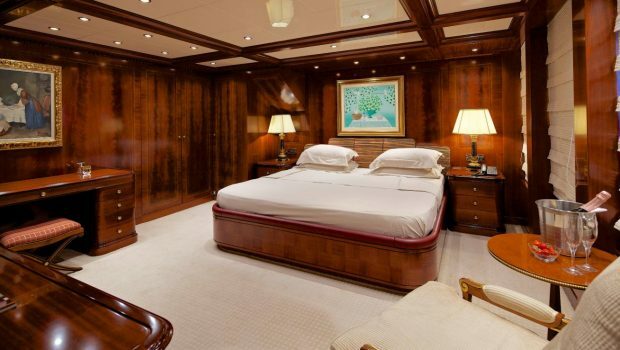 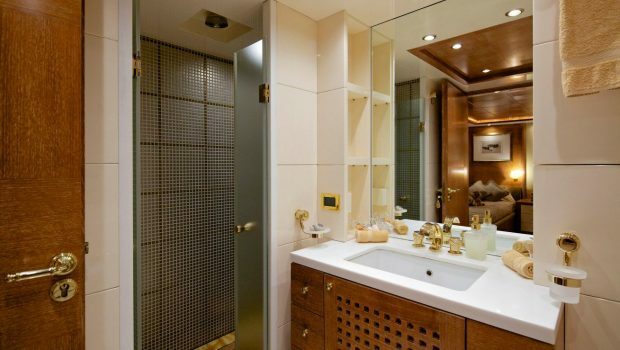 Guests will have little to envy from the Owner’s suite in this elegantly laid out space. Double Cabin: Located on the lower deck, the 2 VIP Double Cabins, are designed with the same precision and detail as the rest of the areas on board. 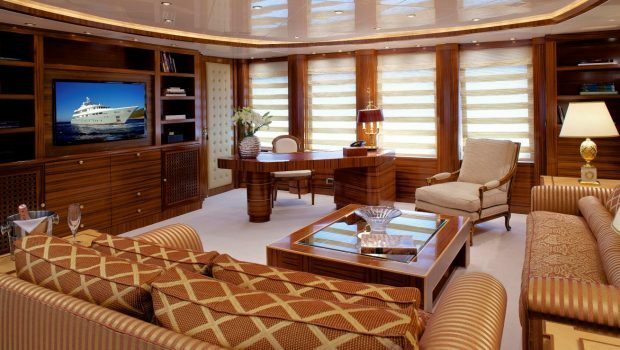 Their burlwood and cherry finishes provide a uniqueness while creating an ambiance of warmth. 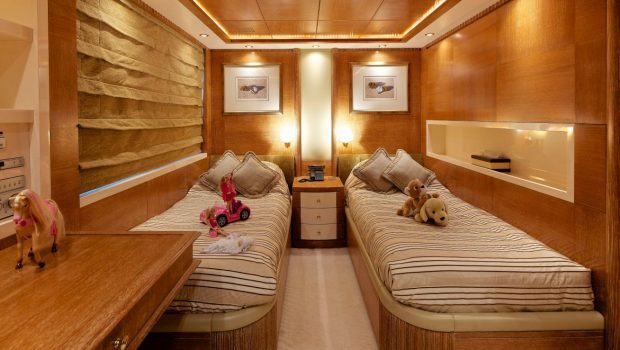 Twin Cabins: The two twin cabins on the lower deck, which feature bleached oak walls, and ceiling panels, include Pullman beds for alternative sleeping arrangements. 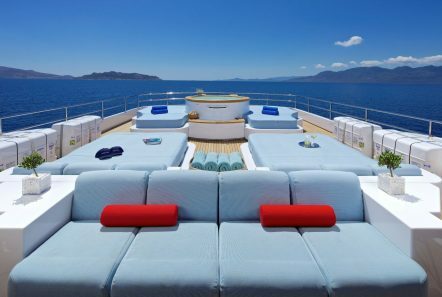 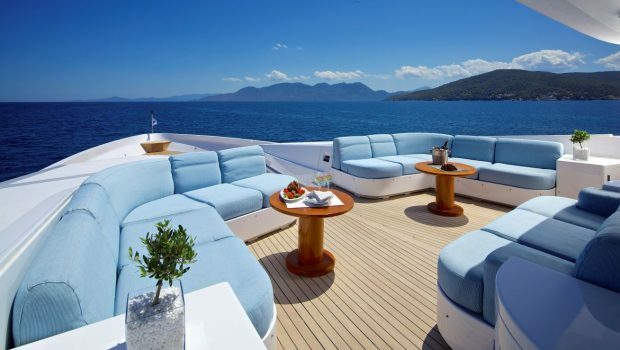 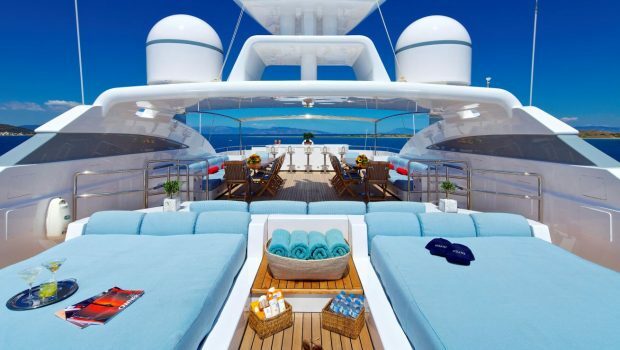 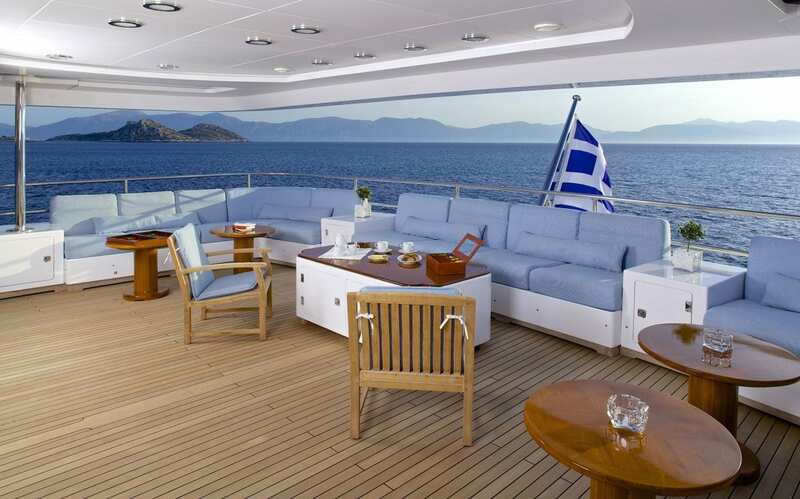 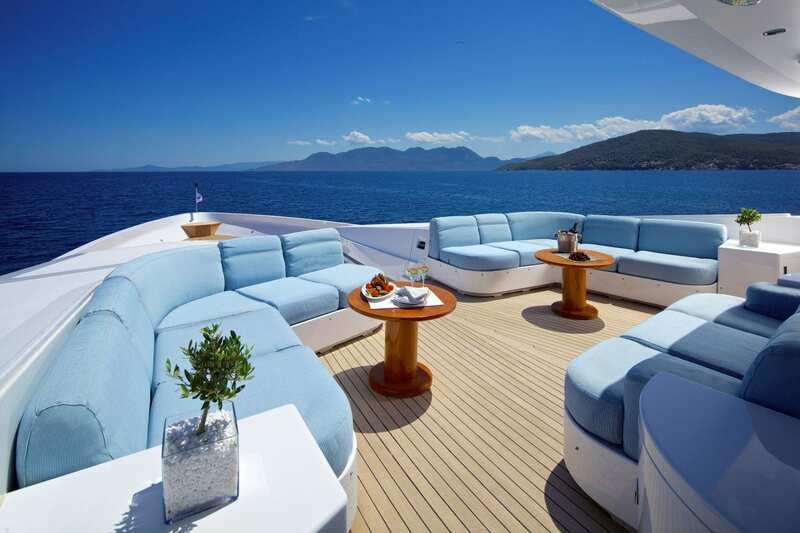 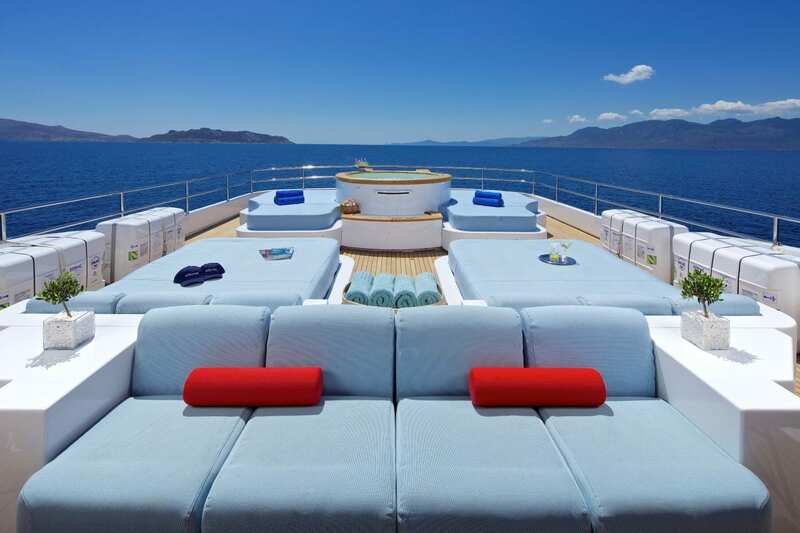 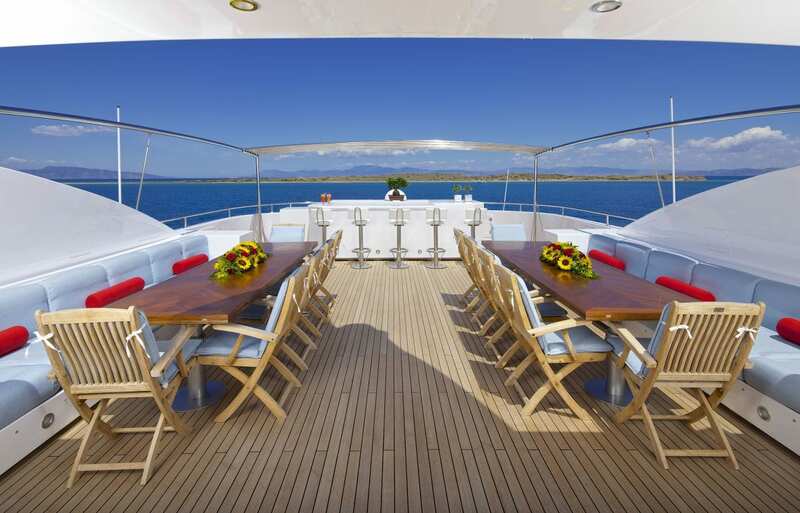 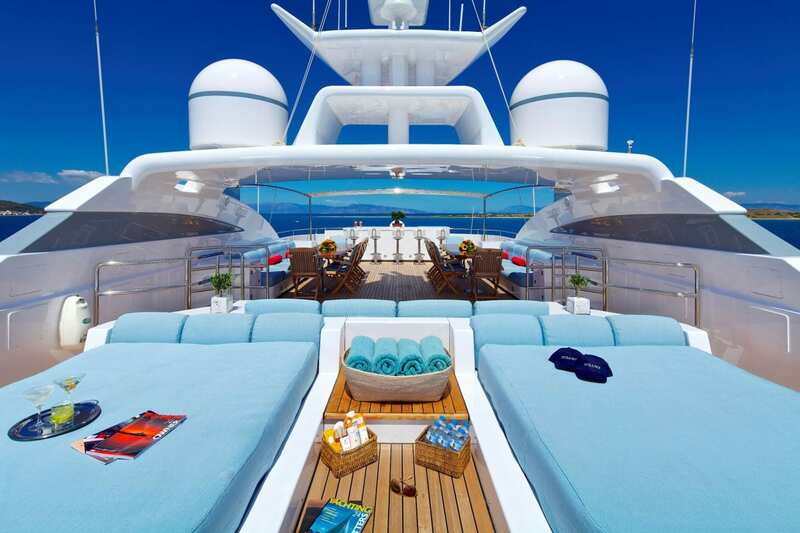 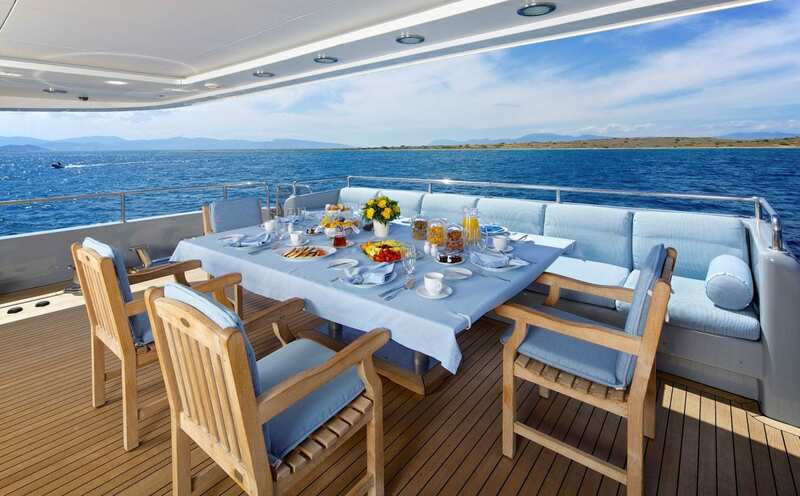 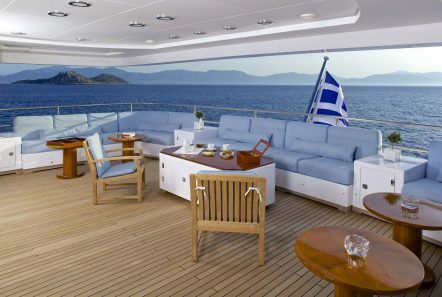 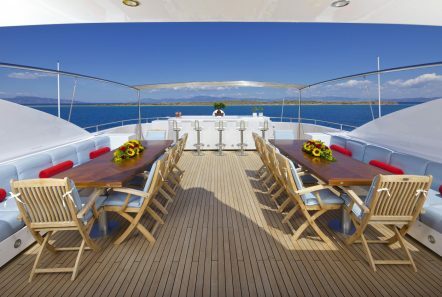 The open air lifestyle on board is exemplified by the 300 square meter Sun Deck. The extendable tables, the full equipped bar with a barbeque, and the four sprawling sun beds and Jacuzzi, all work together to create an environment unlike any other. 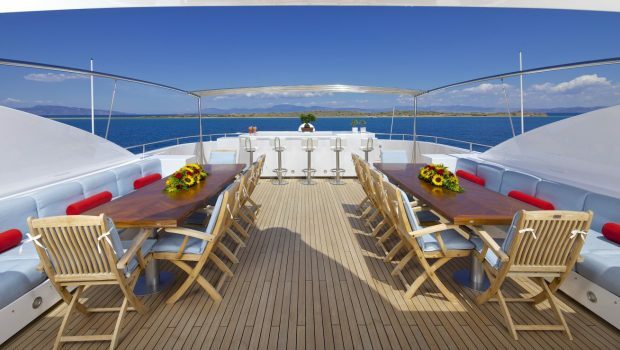 Guests can dine under the stars in pure delight, bask in the sun after a soak in the Jacuzzi or simply enjoy the breeze while relaxing in the shade. 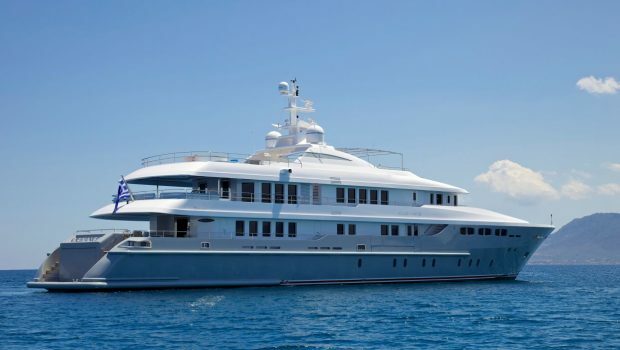 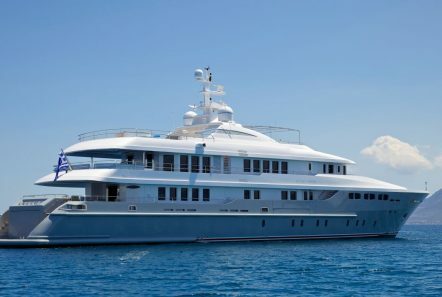 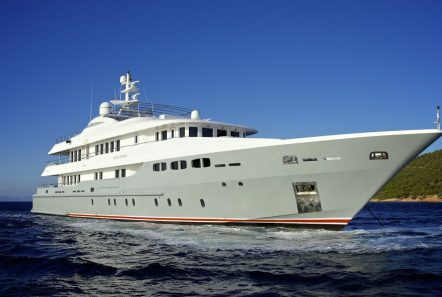 She has Satellite communications and TV, personal computer with internet access, a play station 2, a book, video, DVD, PS2 game library and a closed circuit security TV system throughout. 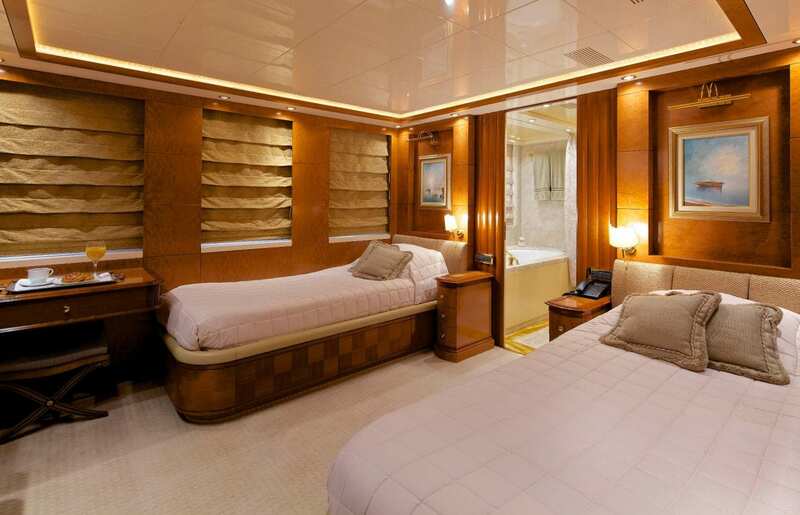 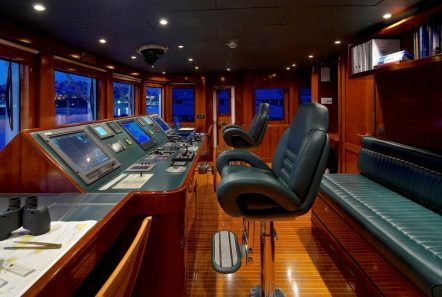 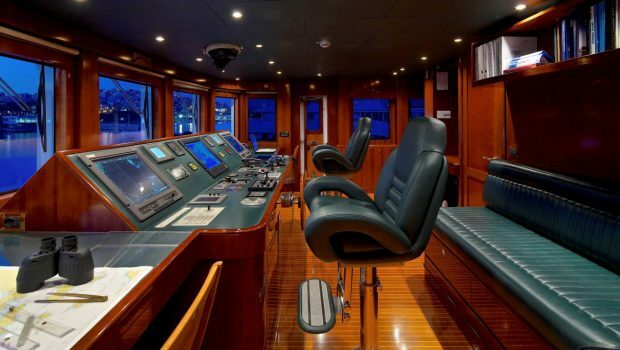 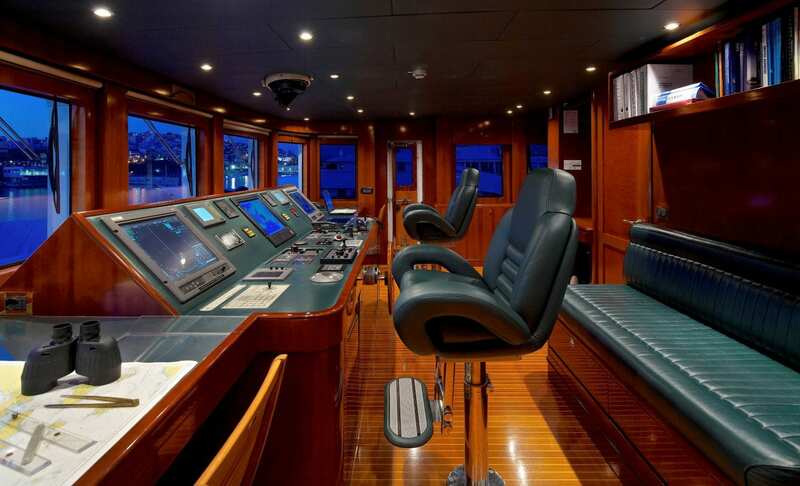 All of the staterooms are fitted with plasma monitors and home theater systems. 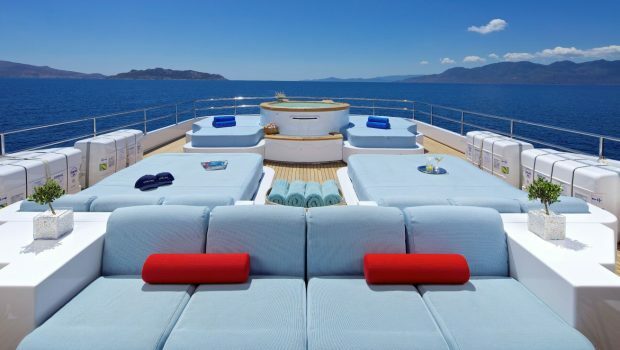 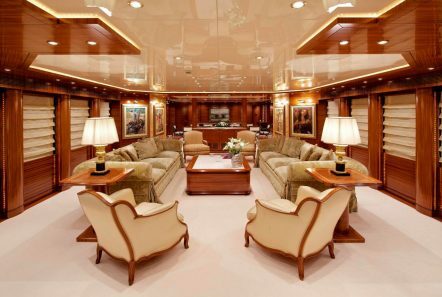 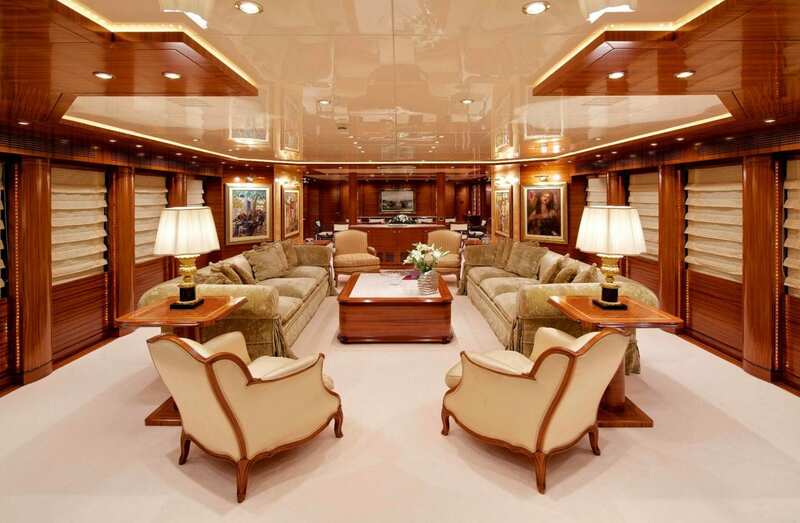 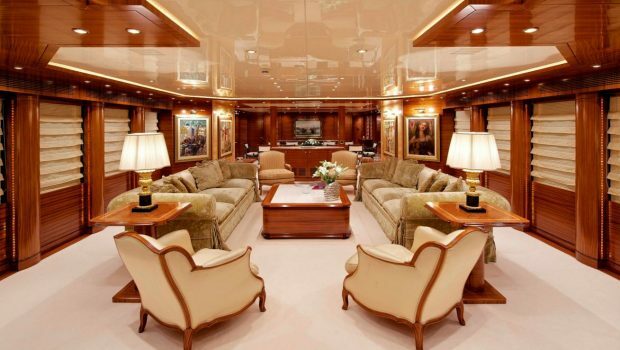 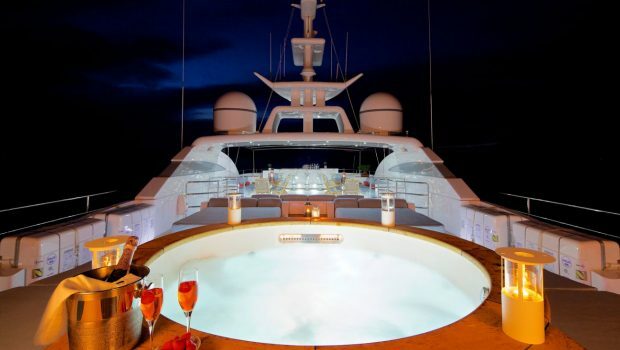 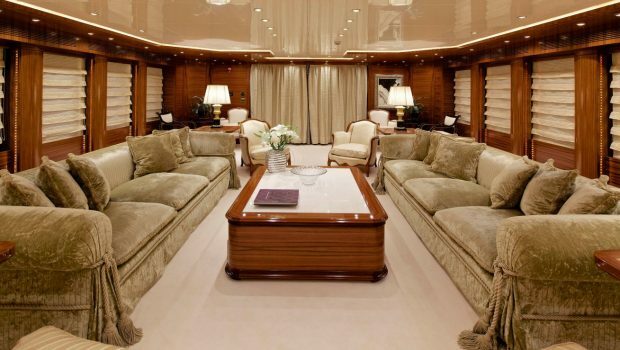 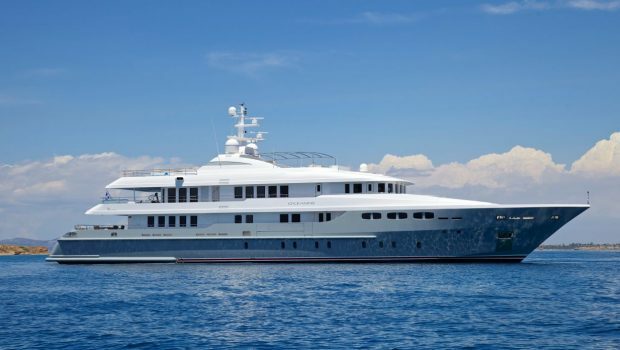 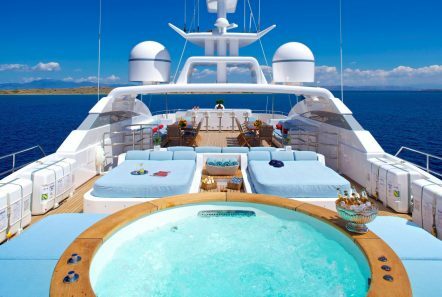 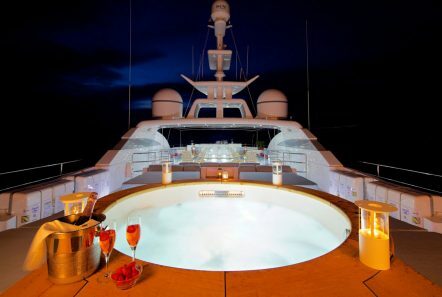 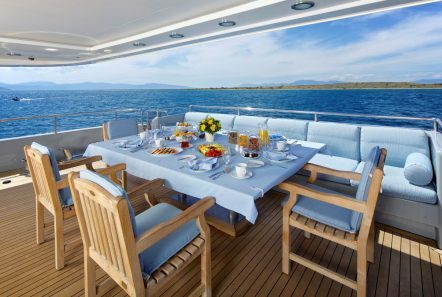 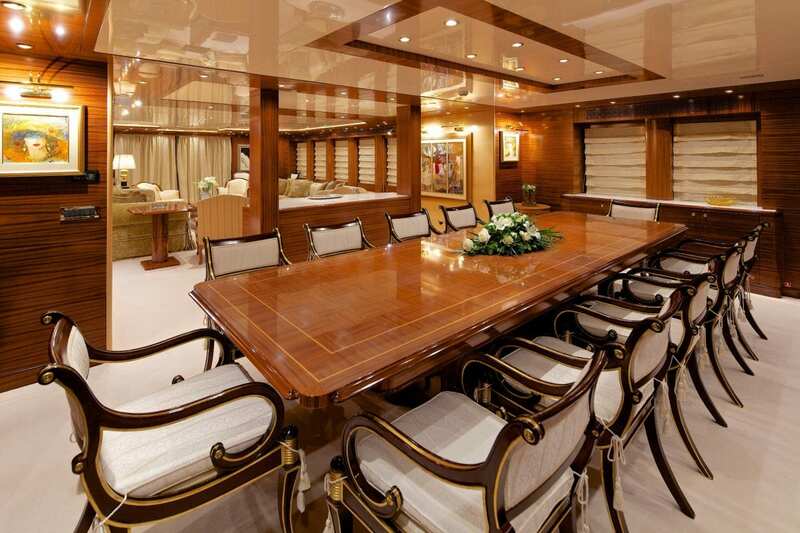 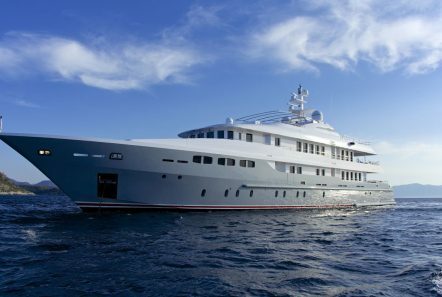 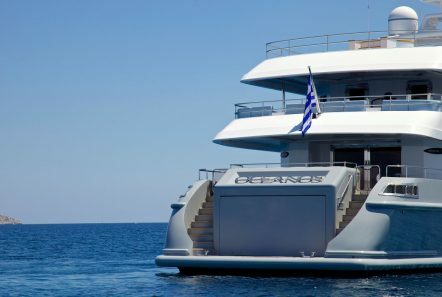 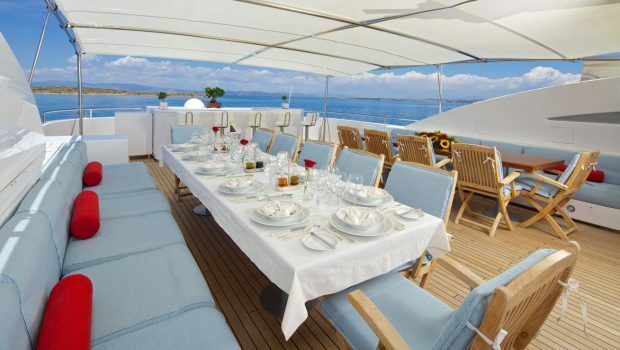 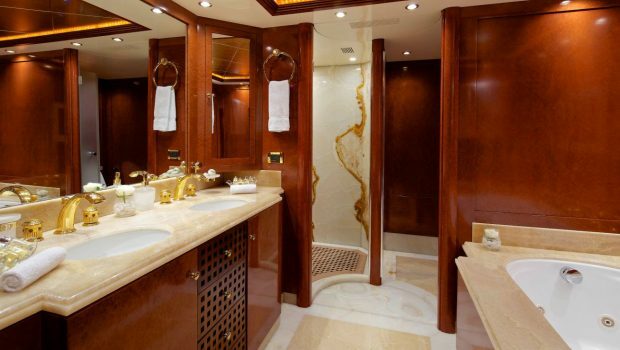 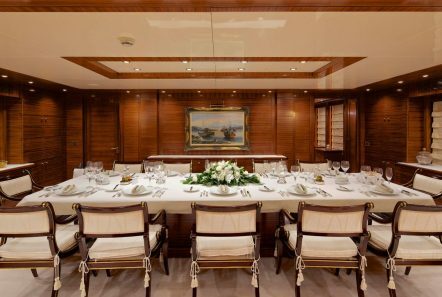 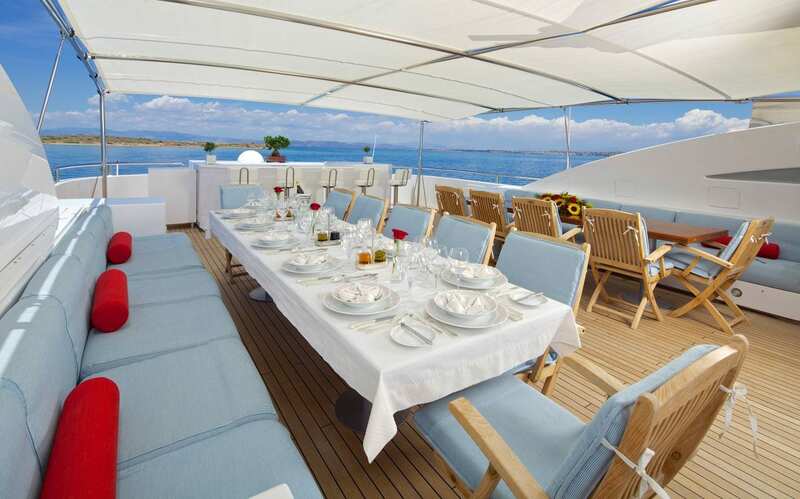 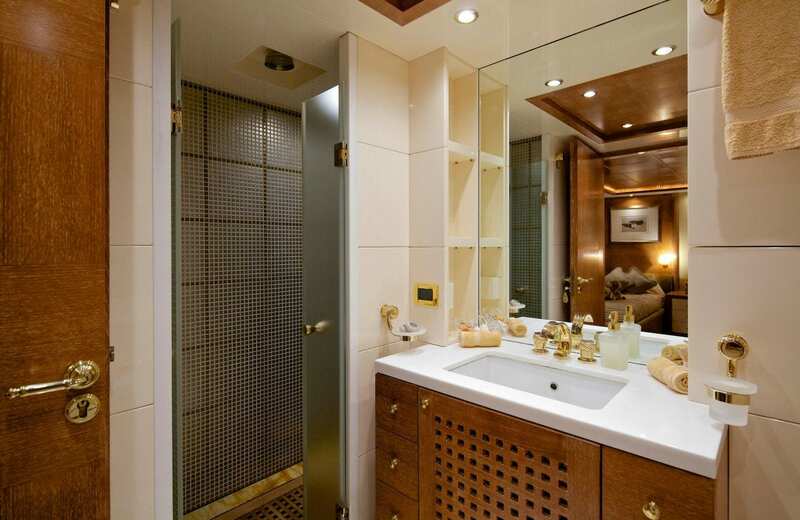 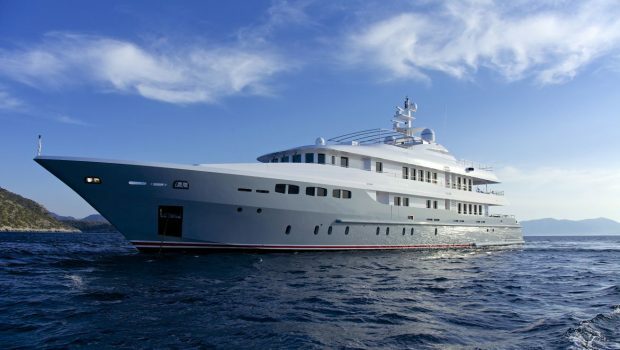 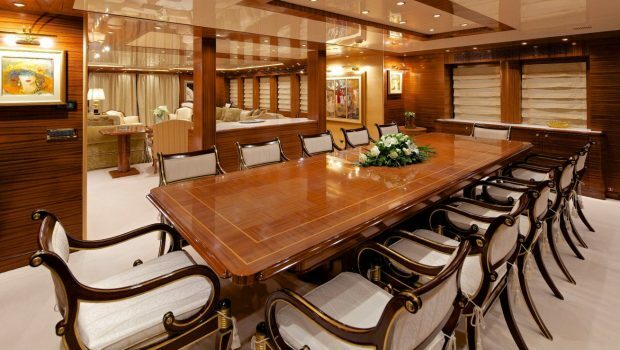 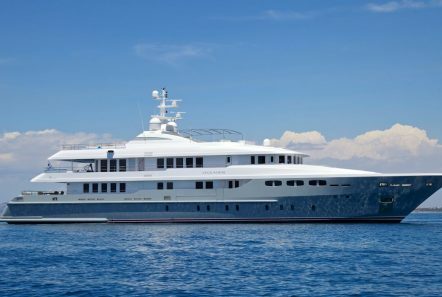 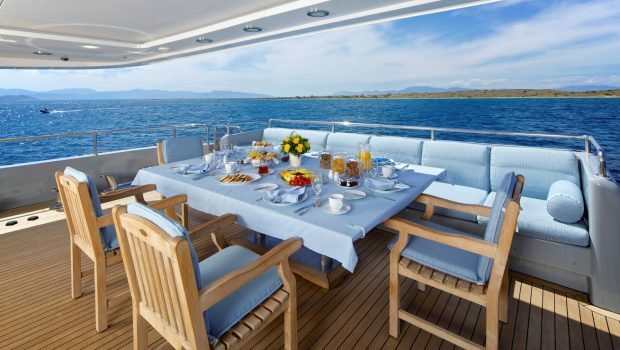 M/Y O’Ceanos will guarantee her guests trips of unparalleled luxury, style and comfort. 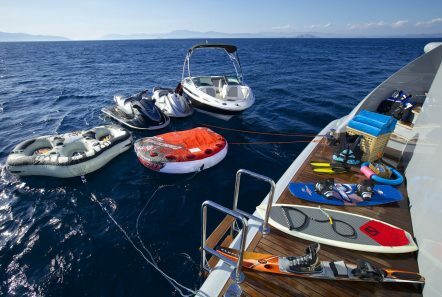 • 2 x Stand up puddle boards. 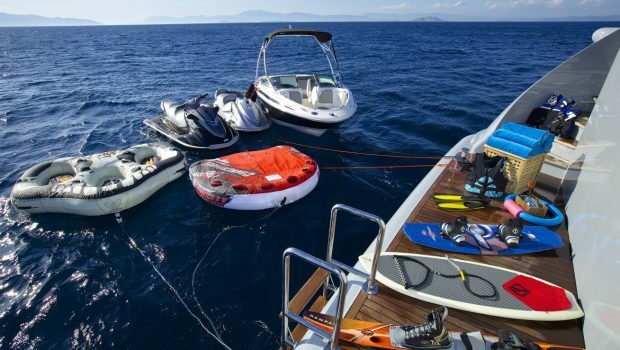 • 1 x Towable tube for one person. 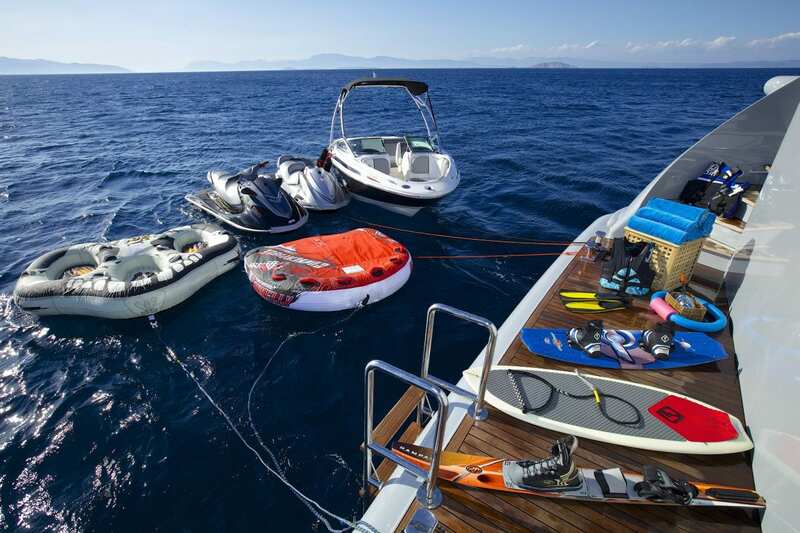 2 x Towable tubes for two persons each. 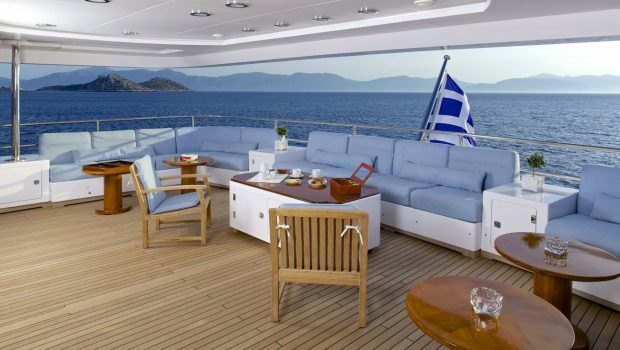 1 x Towable couch for four persons.